I finished the top and got this loaded into the frame. Now I am rather stumped on the quilting. But then I started playing around with some of my rulers and I think I have a better idea. Now to figure out what to do in the middle. I swear it takes me longer to figure out what to quilt, than the actual quilting! 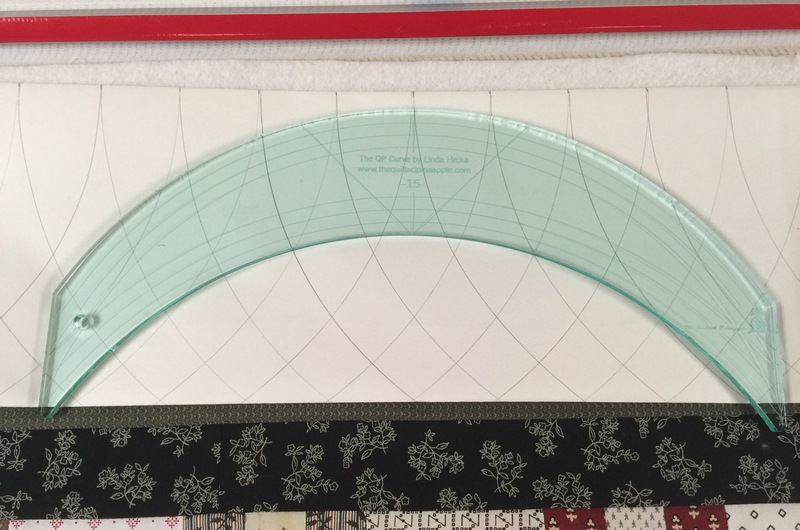 This entry was posted in Long Arm Quilting, Longarm Quilting, Uncategorized. Bookmark the permalink. Beautifully done! This one came together really quickly. Love the deep green with the center panel and 9 patches. I really like where you are going with your thoughts on the quilting. It’s going to be a fabulous quilt. yes! I like the curved design. I’m kind of getting burned out on the feather thing. How about orange peel for your granny squares, and a tile for the middle . . . don’t want to distract from the faces. Very nice top. I LOVE your border plan. As for the center, I think I would just follow the print lines on the panel. It will give a lot of dimension and make it look like applique. And if you really want to do some feathers, they would be perfect for the frames around the portraits. Very cool quilt! Yes! Yes! Yes on that border! Maybe you can repeat the curves some way in the plain blocks with straight lines in the nine patches, and crosshatching in the narrow borders. 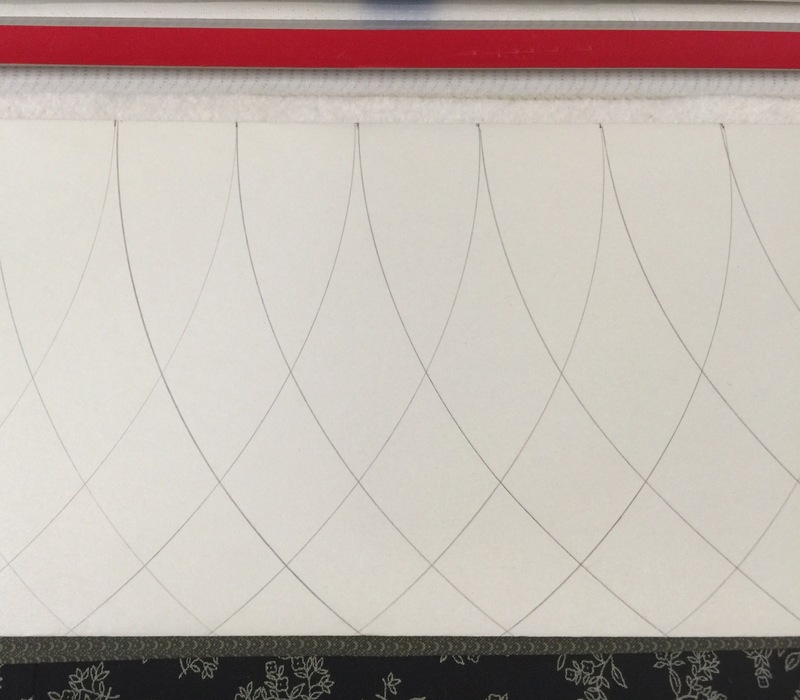 As for the center panel, outline as much as possible. Just some ideas but I know you’ll create some beautiful quilting! The minute you showed that panel, I loved it and I LOVE what you did on the borders too. It looks so vintagy! I sympathize with you on the deciding part. As quickly as you pieced that quilt, you can afford to spend a little extra time on the quilting! Man ALIVE!! That was fast!! I love the solid border you used to set off the nine patches. It goes perfect with the colors in the panel. I really like what you came up with using the curvy ruler! Geez I like that panel. Ohhhh, love that curvy look! Love your choice for the border! I have the same problem with trying to figure out how to quilt…most of my bigger projects have to sit & stew for a few days before I can make up my mind! Nice quilt and it takes longer to load the quilts and then having to decide on how to quilt it….Agree with you. I wish I would break down and do pantograms, but that would be free motion since my long arm is not a computer driven machine! 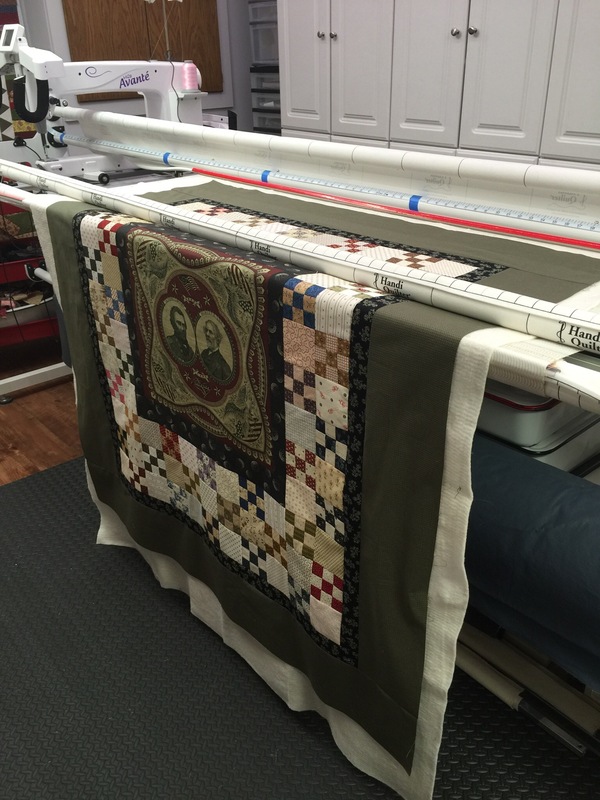 Darn……Looks like you will have a very nice lap quilt and some real pretty quilting stitches to enjoy! Another very nice quilt. Whatever you decide to do, I know it will look amazing. Can’t wait to see it!